Formerly The Crown Oaks, now run as the Kennedy Oaks from 2017 onward, is one of the Melbourne Spring Racing Carnival’s marquee races with a whole meeting known as Ladies’ Day devoted to the three-year-old fillies’ feature every year. Held on the third day of the Melbourne Cup Carnival on the Thursday after the Melbourne Cup on the first Tuesday of November, the 2500m classic runs at Flemington Racecourse and is worth $1 million in prize money. Held since 1861 the race registered as the VRC Oaks was upgraded to a Group 1 event in 1979 and has been won by many notable mares during their three-year-old season including Mosheen (2011), Samantha Miss (2008), Miss Finland (2006), Research (1988), Rose Of Kingston (1981) and Light Fingers (1964). The season’s official Kennedy Oaks 2018 Results and full Kennedy Oaks Finishing Order for 2018 will be published below as of Thursday November 8, 2018. The 2018 Kennedy Oaks Results and finishing order will be placed here once its run. Kennedy Oaks betting markets really go off after the field is released with punters selecting from the capacity 16 fillies in the mix each year. While futures markets are open earlier, waiting for the official line-up is a safer bet. The season’s best staying fillies typically lead the markets and are proven performers in the classic with favourites boasting a strong record with four saluting from 2008 – 2017 most recently Kirramosa (2013). The fillies coming off a win also dominate Crown Oaks odds online with upset winner Lasqueti Spirit (2016) the first since 2012 to win off a loss. In 2017 the VRC Oaks winner Pinot came off a lead-up win in the Ethereal Stakes. The spring’s top Kennedy Oaks 2018 odds and Kennedy Oaks betting market links will be available below once open so you can back your early favourites in the Flemington Group 1 staying race at the best price. Kennedy Oaks tips can be found everywhere during the Melbourne Cup Carnival betting season and it is usually the favourite in the markets leading the early predictions. The best lead-up race into the Kennedy Oaks historically is the Group 2 Wakeful Stakes run on Victoria Derby Day the Saturday prior to the race, which has produced four winners since 2010 including Kirramosa who completed the double in 2013. Other good Kennedy Oaks tips are to back graduates out of earlier Melbourne spring races as Lasqueti Spirit (2016) was the first winner to come off a Sydney lead-up race since Tributes (1999), and to take fillies that are proven at least up to 2000m. Our exclusive Ladbrokes’ Kennedy Oaks 2018 Tips and Kennedy Oaks Group 1 betting predictions will be detailed below the week of the race so stay tuned for the fillies to back and sack in the Cup Carnival clash. 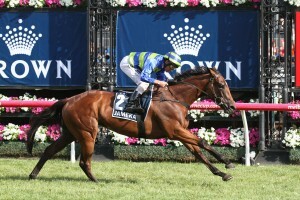 #2 Aristia: Aristia won the Wakeful last week at Flemington, which is always a great form guide heading into the Oaks. In total, 35 Wakeful winners have gone on to win the Oaks, with the most recent being Kirramosa in 2013. She’s never raced over 2000m before, but looked to have plenty left in the tank last start. #3 Qafila: Each of the favourites have question marks about them, and for Qafila, it’s whether or not she can back-up after running second in the Wakeful just six days ago. Fortunately, that run gave the Lindsay Park hopeful some familiarity with the track, and it looked like the three-year old wanted a little more than the 2000m. She’s drawn well with barrier 4 and should have every chance down the inside to figure in the placings. #1 Amphitrite: It’s going to be tough to beat the favourite home in this race. Amphitrite has won twice at Flemington despite failing to run a place in the Group 1 Empire Rose Stakes last start. The distance is a query though considering the three-year old has never raced past a mile. Trainer Darren Weir is yet to win an Oaks, and it looks like he might be waiting a little longer. The Kennedy Oaks field has a capacity of 16 starters and four emergencies and is released on the Monday three days out from the race. Before the Kennedy Oaks final field of acceptances is out the week of the event, the early nominations are taken by Racing Victoria in late September and typically feature around 70 to 80 three-year-old fillies. Fillies may come into the Kennedy Oaks field off a lead-up run in the Group 2 Wakeful Stakes (2000m) held the Saturday before on Derby Day, the double last completed by Kirramosa (2013). Another good lead-up into the Kennedy Oaks field is the classic Group 1 Ladbrokes Cox Plate (2040m) in late October with the last Oaks winner to come off the weight-for-age feature against the older horses being Samantha Miss (3rd in 2008). The official Kennedy Oaks 2018 Final Field and Kennedy Oaks Barrier Draw will be published below once its been officially released. Kennedy Oaks 2018 Nominations close in late September and the full list of early Kennedy Oaks entries will be available right here once announced. The Kennedy Oaks form guide details all the basic information and statistics you need to place a well-informed wager on the classic including the jockeys and trainers of each filly, their starting barrier and lead-up form. Last start winners are always a good way to go with six Crown Oaks winners from 2009 – 2017 having won their lead-up race. Previous form at Flemington is also crucial with all but 10 Kennedy Oaks champs since 1983 having had their final start at the track. A link to the comprehensive Kennedy Oaks 2018 Form Guide will be provided below the week of the race. The Kennedy Oaks results and finishing order of all the starters are known after the event runs as one of the last on the Flemington card on the Thursday meeting in early November. The results reveal not only the winner but also the winning quinella, trifecta and first four and the margins that are all crucial when checking your exotic bets. There have been a number of notable upset Kennedy Oaks results in the past decade including the shock all-the-way win by Lasqueti Spirit ($101) in 2016. Some of the standout Kennedy Oaks winners include subsequent Caulfield Cup winner Jameka (2016), Samantha Miss (2008), Miss Finland (2006) and Research (1988).